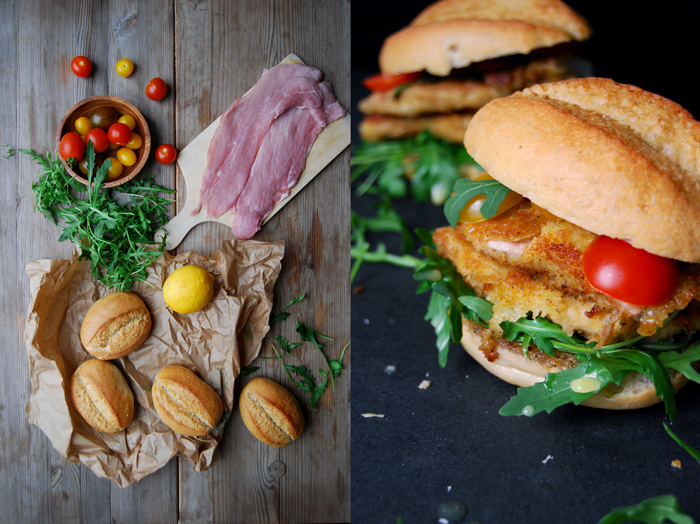 If you ever want to seduce a (non vegetarian) man, make schnitzel, and if you want to be 100% sure that he’ll definitely fall for you, make a schnitzel sandwich! There must be something in this rustic snack that men absolutely love. When I fry schnitzel, I always prepare a bigger batch as I know that the leftovers are more than welcome the next day. To see the satisfaction in someone’s face after the first bite of this breaded piece of meat stuffed in a bun is impressive. 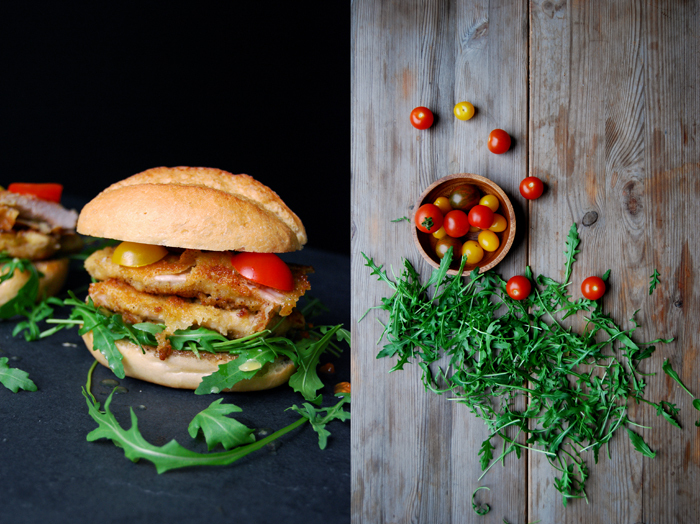 If the man of your heart is a true schnitzel connoisseur this will send him straight to culinary heaven! You could put the cold meat on a slice of white bread and keep it simple which is already delicious, or you could take it to the next level. 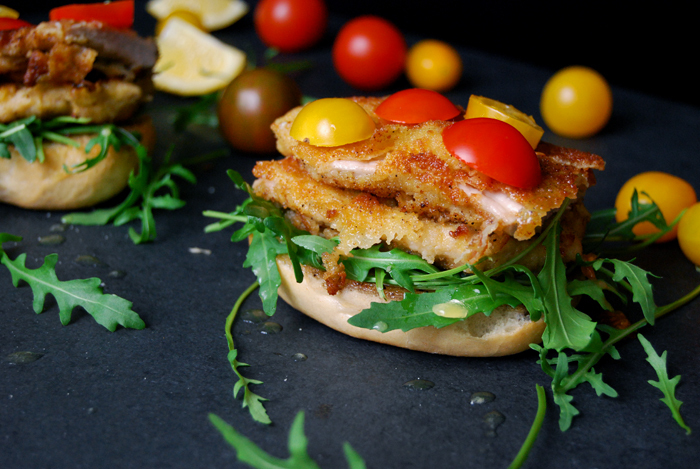 Serve the schnitzel warm, fresh out of the sizzling pan and combine it with crunchy rucola and sweet cherry tomatoes. I drizzled lemon butter over it and that made it absolutely irresistible! 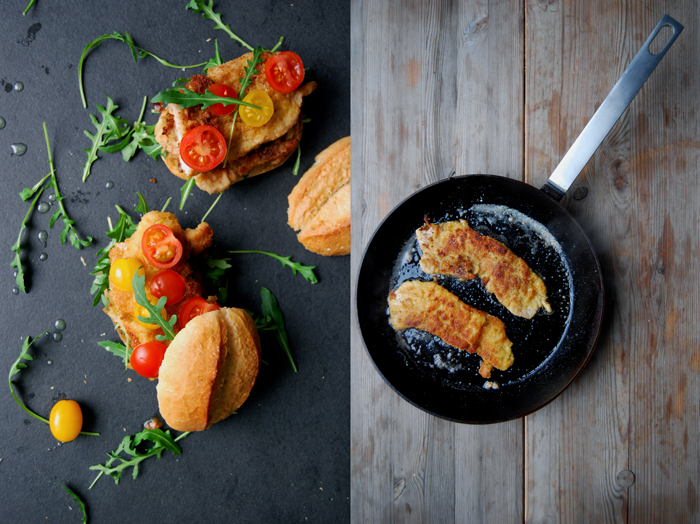 Here’s another one of my schnitzel recipes with Swabian potato salad! In a large heavy pan, heat a generous splash of olive oil and 1-2 tablespoons of butter over a high temperature, the bottom of the pan should be covered. Prepare 3 large, deep plates, fill one with the egg, the other with flour and the last with breadcrumbs. Lightly dust and turn the meat in the flour first, then turn it in the egg and finally, quickly turn it in the breadcrumbs until covered. 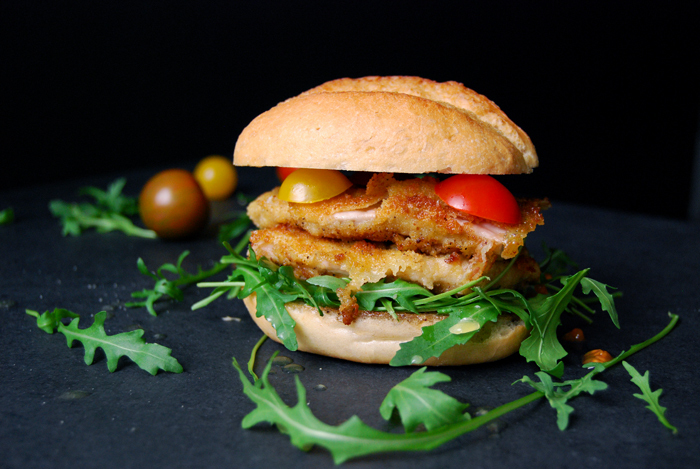 Fry the schnitzel for 1–2 minutes on each side until golden brown. Season with salt and pepper and take the meat out of the pan. Dip the inside of the buns into the pan and let them soak the juices. In a sauce pan, warm up 1 tablespoon of butter and the lemon juice. Take it off the heat when it’s hot. 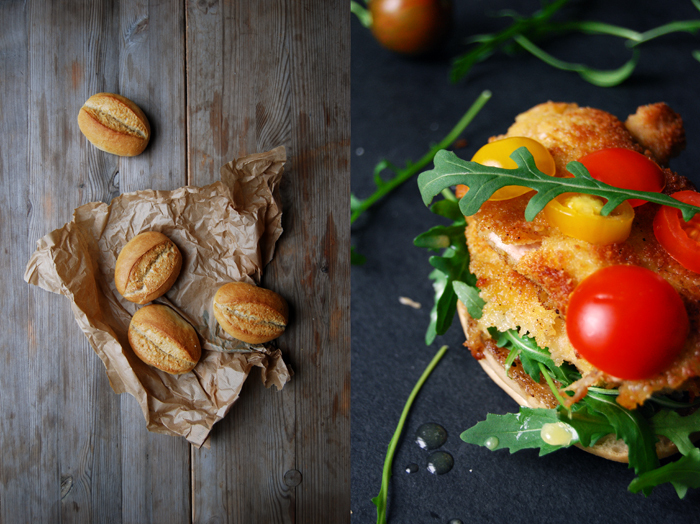 Spread some rucola leaves on the bottom of each bun and put the schnitzel (cut in half) on top. Drizzle the lemon butter over the meat and lay a few tomato slices on top. Close the bun, squeeze it and enjoy in good company!